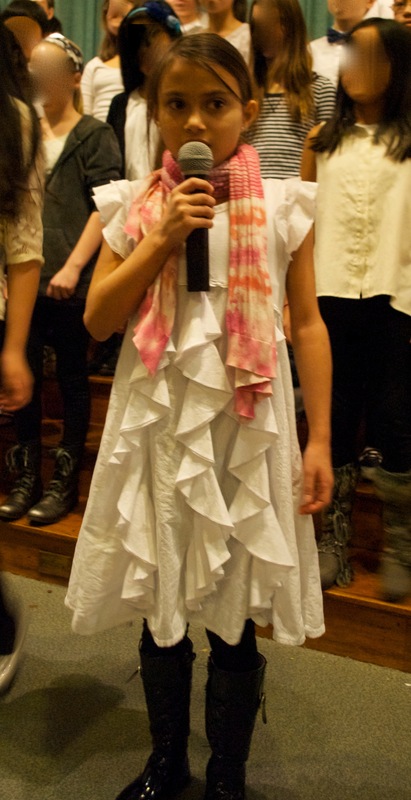 THIS is how it happened that my girl was to sing a solo – A SOLO – in her winter concert. This is what I posted on Diary’s Facebook page last night when it was alllllmmmmooossssttt time. 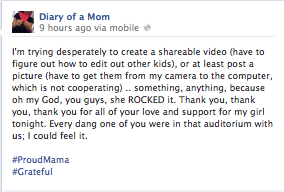 This is what I posted after the show ..
And this is what I posted after an hour of pretending that I had any clue as to how to edit video ..
And finally, this is a mama who is bursting with pride in her girl and overwhelmed with gratitude for all of those – all of you – who were right there in that auditorium with us last night. I’ve also been watching it over and over. Brooke is a rock star! Give her a stage, any stage, and she’s good to go. She truly amazes me. So, so awesome. Congratulations to Brooke and your entire family! I had a very rough day yesterday with a little guy. His struggles brought me to tears but this morning I have tears for a different reason. Brooke brings me so much hope. Her face after that solo just made my day. Thank you so much for sharing. I feel so proud of her, so I can only imagine that you’re overflowing with it. She was amazing. No, she IS amazing. 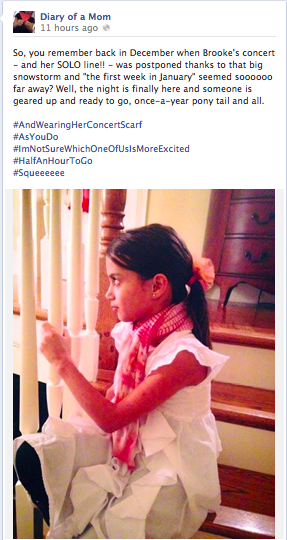 Brava, Brooke. Yay!!! beautiful! (sniff, sniff) 🙂 And congrats momma! I love this! We sang this song a lifetime ago and it was awesome then for a bunch of HSers who “gotta find my corner…of the sky”. Whoo hoo Brooke and family! Way to Go!!!!! I hope you all enjoy her success. Brooke will have many more achievements and conquer the world! Thank you for sharing this ride with all of us. This is amazing, beautiful, and just WOW!! I am crying here along with you!! LOVE IT!!! Wow…just wow. I’m overwhelmed. What a great kid! I keep playing it over just to see that look of barely contained pride after her solo! So poised. So confident. So self-assured. This is a girl that isn’t going to let the world keep her down. I’m pretty sure you have many,many followers that will be keeping this video handy for the dark days. She’s such an inspiration! Thank you for sharing, and please tell her I think she’s just amazing! yay!!!!! Go Brooke!!! She did great! Love love love this! For her and for you! And to have this recorded-priceless! My all time favorite video of my son is him performing a song with his 1st grade class, for a special mothers day lunch-Chicken Soup with Rice-and during the entire performance he was stimming by pinching his nose. But he was dancing, giving funny looks, re-enacting parts of the song, engaging in the activity. To this day I am so thankful to that 1st grade teacher who didn’t judge him for his struggles but nurtured him for the gifts he does have. So happy for her that she can enjoy this success and revel in it, and relive it, and build from it and soar! 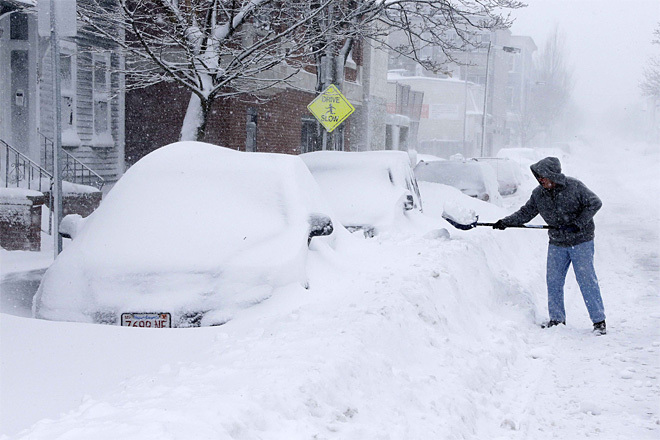 2014: I know you’re new and all and you’re probably wondering, “Wow, what was THAT? !” That was you getting tackled by Brooke. It’s something you should get used to; she’ll be doing a lot of it over the next 12 months. I know she looks all innocent and sweet, but she’s a force to be reckoned with…a one-kid revolution. Just ask 2013. Love it! I am crying happy tears. And singing a happy song in my heart!!! WOW…so very proud of her…such confidence…such an attitude of “this is no big deal, but a BIG deal” comes through on her face while she’s waiting for her moment. Jess, if I have a blog crush on you AND M – is that cheating? Thank you, dear one, for sharing this intimate part of your lives. We buried my mother-in-love yesterday and she was so very close with my granddaughter, Isabella. My emotions are running high and this post was just what I needed today. It gave me joy. “The best of ever!” indeed! Way to go amazing little lady!! My son had a concert last year with his whole kindergarten, he sat out by himself on the side of the risers, then when we got in the car to leave, he gave us a private concert of the songs he liked best. So amazed at how she is able to be on stage and perform!! Thanks for sharing! ❤ Shining, gleaming moments like this- of joy, hope, dreams come true, and all the unlimited possibilities of what is yet to come- they make our hearts sing along with Brooke 🙂 Warm hugs from our family to yours. So stinkin’ proud!!! Best show of ever for sure! PS The Pippin song always does me in too. I can’t remember where I learned it – I wonder if we did it in a show when I was a kid. Could be, judging from the speed at which it leaped into my brain the moment I read the lyrics here. That IS the best show of ever, she nailed it! NO ACCIDENTS!!!! Wonderful! I would watch it again and again and again, if I were you. These are the best times! o my goodness, this is just so lovely. I was watching the flashbulbs going off and thinking how painful I know those are for my guy and watching Brooke standing there so poised and confident just doing her thing like it just ain’t no thing at all. Brilliant. AWESOME! AWESOME! AWESOME!!!!!!!!! So proud and happy and blessed to see Brooke shine! Love the video !congratulations ! Beautiful and amazing! My son loved to sing, but with his speech problems, he always struggled to keep up with the pace of the songs and it was very frustrating for him. Then with his anxiety, he would be overwhelmed at the idea of being on stage, and several years he ended up suspended for the performance week. Then, in fifth grade, he was in a special school. The amazing music teacher told me that she wanted to give him a solo for the Christmas concert. I told him his history, that he’d only actually been in the room for previous programs a couple of times, and never even participated. She was surprised because of how well he was doing in class, and she told me that she was willing to work with him on it if I was. We talked about it for weeks – what it would be like, how many people would be there, that they would all be rooting for him, that even if he messed up, they would still applaud (one of his worries). Dress rehearsal came, and he panicked. Wouldn’t go on stage, ran out of the room. More talking, more support from the teacher. Performance day came, and … he did it. He really did it. And it was beautiful. He forgot the words at one point, but he didn’t panic, and jumped back in when he remembered. I cried. His teacher cried. His dad cried. MY dad cried. It’s been seven years, and I still cry when I think of that day. I am so happy for you and Brooke! What a wonderful job she did. Go Brooke!! Wow, that is ALL kinds of awesome. 🙂 Thank you for sharing. I’ve never met Brooke and I live a million miles away but watching that video, the level of pride I felt for her, you would think she was my very own niece or something. Had to fight back the tears watching this one. So so proud of you Brooke! You rocked that solo like a boss! How very lovely! 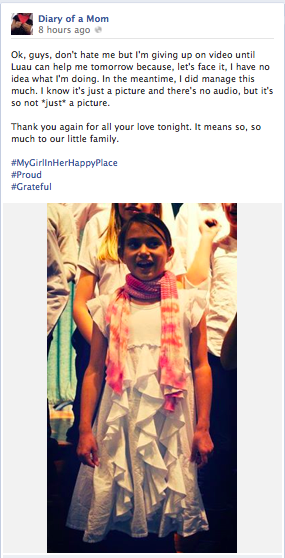 Thanks so much for sharing with Brooke’s fans! From the moment of her gracefully stepping to her solo place with the mike, to her resuming her spot in the group, Brooke looked very comfortable and did great. This video one of the joys of this season for me.